Of the 175 wine growers in Vacqueyras; only 45 are bottling their own wines and selling direct from the domaine, with the rest selling to the co-op or to one of the three négociants in town. 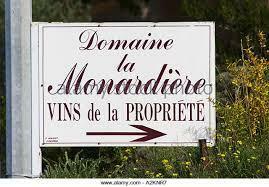 The Vache family of Domaine la Monardière falls amongst the growers. The Vache family bought their domaine in 1987 from the Monarde family, and immediately got to work revitalizing the vineyards, building a new winemaking facility. They began by selling the wines from the domaine's door. The Vaches also harvest all of their vineyards by hand, which is not a requirement of AOC Vacqueyras, nor is it a common practice. They have been working organically in the vineyards since 2000, but only began the certification process in 2007, and have now been certified since 2010. They have 22 hectares total, 18 hectares in Vacqueyras and 4 hectares in Vaucluse. They never purchase any fruit or must. Monardiere has a lot of sandy soil and so they make a significant amount of rose and white - the total for both in the appelation is only 5%, but 15% of Monardiere's wine is rose and another 15% is white. Sixty percent of the appellation is on a plateau with a lot of stones and a clay subsoil. For all of the wines, they work with lower yields than the 36hl/ha that are allowed. They normally average 30-32hl/ha, but recent vintages have been hit hard 22 hl/ha in 2012 and 18hl/ha in 2013! Since they practice organic viticulture, it only follows that they should vinify with as little intervention in the cellar as possible, to produce authentic wines that are true to their origin. After harvest, the grapes are sorted and mostly destemmed, and then put into cement vats; the indigenous yeasts found on the grapes start the fermentation naturally. They pump-over the wine daily for a gentle extraction. The Syrah and some of the Grenache vats are punched down manually, and maceration takes place for two to three weeks. The wines are then aged in vats or used barrels throughout the winter and then bottled without fining or filtration and a low amout of sulfur. The Monardiere wines offer an incredibly pure expression of Vacqueyras.